Whether you’re still thinking of buying a pontoon or you already have one chilling in the local marina, you might be wondering whether your boat is safe to use in rough waters. 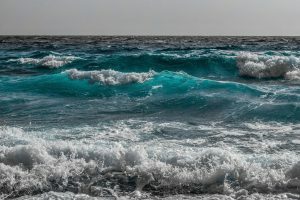 Rough waters can be everything from still waters during a storm, or even the open sea during a sunny but rather windy day. So, let’s tackle the most important questions – can pontoons handle rough waters? The short answer is yes. Pontoons are actually pretty good at handling rough waters, especially if you compare them with one-hull recreational boats. The two hulls of a pontoon create more friction between the water surface and the bottom of your boat, making it a pretty stable vessel. The only thing that could be more stable is a tritoon, as those have three whole hulls in contact with the water surface. This goes without saying, but you must always read the marine weather forecast for your area before sailing out. However, that might not always be enough, as the weather can be really unstable in certain areas, and during certain season (especially late spring to early summer.) Put your captain senses on and keep an eye on the sky and waters, as well as any wind that feels like it would bring something troublesome. Make sure you know the load limit your ‘toon can handle, and never take on more weight. It might turn out to be a question of life and death, especially if the extra weight you’re carrying are passengers. Always make sure that your passengers know how to distribute weight across the deck in case of rough conditions. Generally, the lower the boat, the higher the stability. However, if you’re the proud owner of a double decker, or a ‘toon with a second level that is taller than your average one, you might want to be extra wary of sailing in rough waters. With double deckers, it’s always better to postpone your weekend on the lake for another day if the weather seems unstable. If the worst has happened and the storm has caught you in the open water, the most important thing is to keep calm. Instruct your passengers to distribute their weight evenly across the deck, and try sailing against the waves. Most people would immediately start going full force against the waves – and that is almost the right thing to do. Yes, in case of rough waters, you want to trim up rather than slowing down, to avoid burying the nosecones. However, your best bet would be to go against the wave at a 45 degree angle (rather than straight) to avoid burying the nose of the pontoon and getting water on the deck. Bottom line here is yes, pontoons are definitely one of the more stable types of recreational boats out there. They handle rough water pretty well, but that doesn’t mean you should be careless when sailing out – it’s always better to be prepared. Getting caught in a storm is a really scary experience, had that happen to me a couple summers ago and thinking back on it now, I would have handled it ciompletely differently. Thanks for sharing your thoughts on this too!